Click on article to zoom and open in new window. According to this article in The Courier Mail today 12th February 2019 by Renee Viellaris and Daryl Passmore, Southeast Queensland looks set to be awarded the biggest City Deal in the country, with Prime Minister Scott Morrison revealing support for an ambitious plan to modernise the region. A City Deal is an agreement between Councils, state and federal governments on priorities and funding. This would be the biggest in Australia. Modelling by KPMG indicates an SEQ City Deal would deliver a $58 billion boost to the region’s economy over the next 25 years. 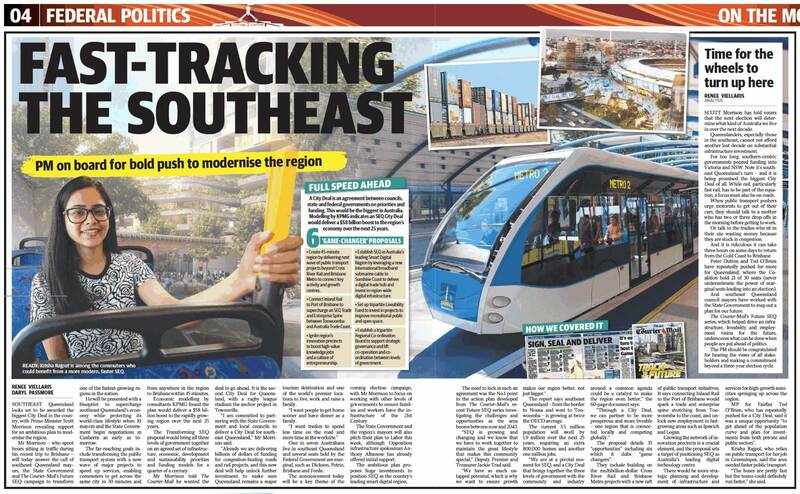 The far-reaching goals include transforming the public transport system with a new wave of major projects to speed up services, enabling commuters to get across the same city in 30 minutes and from anywhere in the region to Brisbane with 45 minutes. 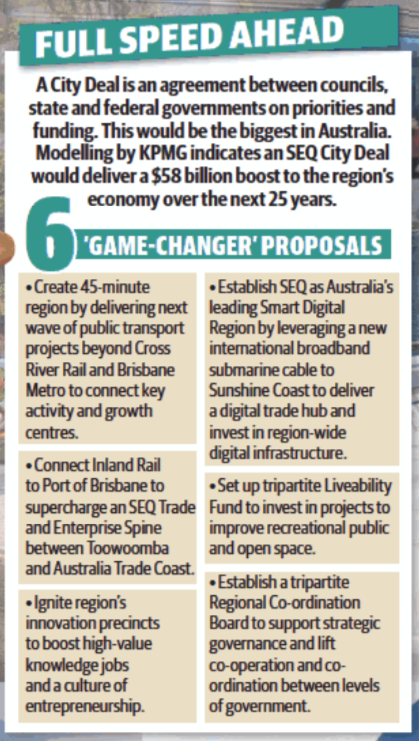 The ambitious plan proposes huge investments to position SEQ as the country’s leading smart digital region. Growing the network of innovation precincts is a crucial element, and the proposal sets a target of positioning SEQ as Australia’s leading digital technology centre.